When it comes to redesigning an outdated or slightly wonky kitchen, the backsplash design is one of the most crucial decisions you'll make. 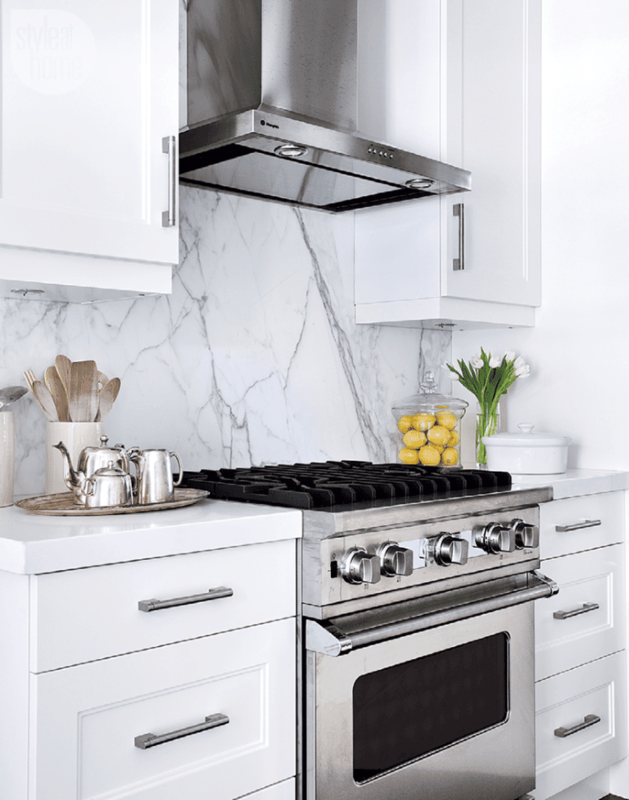 At the moment, a tiled backsplash is all the rage, you'll hardly see a home renovation online that doesn't have those nearly ubiquitous white subway tiles in the kitchen. We love the look, but it is, like everything else, a trend! If that look doesn't appeal to you, the simple (and practical!) alternative of a solid backsplash—in glass, concrete, or even stainless steel—might be exactly what you're looking for to set your kitchen apart from the pack. A solid or sheet backsplash, like this one was designed by Elle Jungkind and featured on Greystone Statement Interiors, is a great way to add a very functional element of sleek design to your kitchen. A glass sheet backsplash is perhaps the most common way to achieve the look with a very specific material—but the point is that a solid piece of material behind your sink and cooking areas is sophisticated and cool—not to mention much easier to clean than a backsplash with grout and tiles. There are a number of different materials you can use to design a solid backsplash in your kitchen, and we'll walk you through some of the most popular options out there. Here in the home of Nichol Naranjo in Albuquerque, New Mexico (recently featured in Glitter Guide), she has embraced a mostly-white design scheme in an interesting way. The cabinets, counters and walls are all a simple, stark white with little variation or detail. The all-white backsplash serves as a way to help melt that area into the background, letting the bright gold and glass shelving above the cabinets draw the eye upwards. For those who cannot custom-install a real sheet backsplash (like renters) a fresh coat of paint that blends this area into the rest of the kitchen is a good fix to mimic the effect. Like with a sheet backsplash, you won't have to worry about seams or grout, which always makes kitchen cleanup much easier. It's hard to explain just how much we love the look of this kitchen remodel from Amber Interiors. The hunter green cabinets are unexpected but so sophisticated, and the old fashioned-looking range is an eye-catching alternative to the usual Viking you might see in a high-end kitchen like this. To keep this cooking space from looking too complicated and busy, the designers have finished both the countertops and the backsplash in a beautiful light grey and white marble. Combined with the raw wood shelving and green cabinets, the result is a polished rustic farmhouse vibe we can't get enough of. Note that designing your countertops and backsplash the same material is a great way to create continuity and let other elements of the room shine—like quirky color cabinetry or elaborate display shelving. If you're attracted by a slightly industrial energy in the kitchen—not unlike something you'd fine in a high-end restaurant, you might like the look of a concrete backsplash. Combined here with a stainless, ultra-deep sink and white cabinetry, the overall look is eye-catching and even slightly masculine. This design, from an Irwin Construction project, looks like a kitchen that is meant to be used as much as it is to be admired. With stainless appliances, a concrete backsplash creates a kind of monochromatic feel, which can allow for more playful elements to be introduced as details, like a bright pink KitchenAid mixer or colorful glassware you can see through glass cabinet doors. As a finishing touch, we'd take another cue from Irwin and incorporate a similarly industrial lighting fixture, like this large Edison bulb pendant. ​Speaking of functional and industrial, this stainless steel backsplash from Smith Designs definitely reminds us of something you'd see in a restaurant or in the home of a professional chef. In our opinion, to make this work in your home, the appliances you choose must also speak to this functionality, as you can see from the major 6-burner range featured here and sleek black cabinetry. We also love the small stainless ledge shelves that are conveniently placed near the range and stocked with all the oils and spices you might need to grab at a moment's notice when prepping a meal. The glass backsplash trend is one that started in Europe, but has been steadily gaining exposure and popularity in contemporary designs here in the US. If you're considering doing this in your home, note that some contractors already have sheet glass offerings in a variety of colors (this pretty blue we spotted in a recent post from Eatwell101), but you can also opt to have clear glass custom painted and baked to finish, which eliminates the risk of chips or damage once installed. This type of sheet backsplash looks is especially visually clean, as you get the shine and reflection of glass, and no grout or seams to clean. Using color in this way is also an unexpected tactic for giving your kitchen a unique character, as seen here with the sky blue glass backsplash. We've also seen incredible kitchen designs with red, yellow or even soft pink glass sheet backsplashes. As part of a thoroughly modern and minimalist kitchen design, we love the look of a glossy black sheet backsplash that extends throughout the entire cooking area. The stark contrast with bright white cabinetry, black pendant lights and a touch of natural wood (From Sarah Waller Design, shown recently in a home tour on Domino) is incredibly striking. To achieve this look, you can look into a few different material options including glass, granite, marble and more. The point is to select a material that will reflect and shine, so a matte paint or tile will not achieve the same effect. And finally, if you're considering a backsplash update in your kitchen, don't miss our complete kitchen and bathroom backsplash guide, which is perfect for setting expectations and project management whether you're hiring a contractor or going full DIY. And for more inspiration on different types of backsplashes, we've got 30 design ideas you should see. You may also want to brush up on the best types of backsplash materials, from travertine tile to stone and ceramics.